That’s not the choice I would have made, but then again I’m boxed in by my decision to eat school lunch every day. But if it came down to not eating or eating, I would eat this lunch. Hey, there was real chicken in the rice bowl! I admit to being stoked about that. You can see below I only avoided the orange (too hard to peel in the time I have — we’ve talked about how ideally they should be sliced up) and the breadstick. I don’t think the breadstick adds anything to this meal. In fact, it’s empty calories checking the “grain” box for the USDA’s school lunch requirements. There needs to be two grains in every lunch and rice counts as just one. Is it wrong to call it a bread tampon? A teacher confided in me this week, “I don’t enjoy teaching like I used to.” I can’t imagine why not….the testing seems to be the biggest difference between teaching of old and teaching nowadays. Teaching is fun, testing is not. I believe in the value of a good pre- and post-test, but it’s getting a little out of hand. Teachers are testing in the hallways for days while subs teach the class. Teachers have student teachers teach so they can grade and do other special projects just to stay on top of things. About 30% of teachers leave the profession after three years and 45% are out after five (citation). In that same article it is noted that most teachers cite lack of administrative support as the primary reason for leaving the profession (38%) followed by workplace conditions (32%). I’ll be the first to admit that I’m an educator to touch lives. If I’m not making a difference, then what’s the point? One of the fun things about attending a blogger conference is the discussion about things only bloggers care about and which would bore any non-blogger. For example, one topic of conversation was comments. I found out at BlogHer Food that many people delete comments. I found that to be interesting since I actually rarely delete comments. I only delete if it’s spam or when some attacks me personally or uses an expletive. I think I have deleted about 5-10 comments since I started moderating in April. I did delete a comment the other day though. The person wrote, “Please make love to me!” and then linked to a nasty website. I have to admit, that was funny! 1) Boldness – Have you ever attended a professional conference for work? That would be entirely different than attending a blog conference. If a conference is for professional development, you are there to learn and not network very much. It’s often a passive, learning experience. Going to a food blog conference is different: you need to mingle. In fact, those interactions outside of sessions are potentially more important that what’s happening inside the session. I picked all the talks on the “Values” track (food politics, urban farming, and canning), but by doing that I missed out on other discussions that might have been interesting. At the end I figured out that I needed to room hop a little and ducked out of the last session. From there I wandered into a PR room for free natural, fermented soda (unbelievable stuff!). 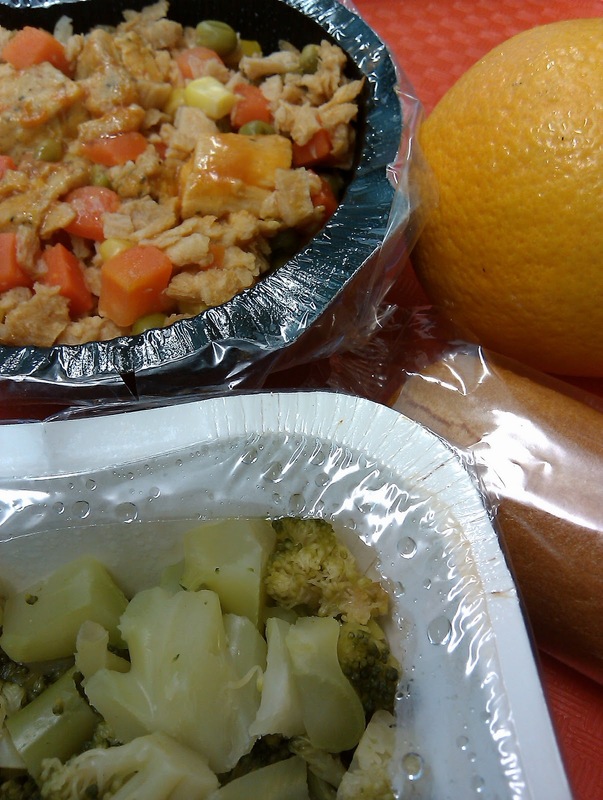 I ended up chatting with a PR guy who was very interested in school lunch reform (who knew). Be bold (I wasn’t very bold, but I will be next time), talk to everyone, have a card. Even I had a card — hey, what can I say, I want more publicity the cause of school lunch reform and the blog too. Food bloggers are a perfect audience. 2) Cliques – I came into the conference feeling so nervous that at first I sought out a space where I could be left alone. I know, how social of me. I had trouble processing the whole experience and right away I could see how it could be quite lonely going to a conference like this. It seemed like there were definite cliques among certain bloggers. I can imagine that many people were trying to find a comfort zone. I can relate to wanting to be in a small group because I too didn’t want to cast a large net (I am anonymous after all). But I was thrilled to meet anyone who came up to me to chat. On the flipside, everyone who I approached was friendly and welcoming, but it seemed from a far that a few people did stick together quite a bit. If you want to enter another person’s group, refer to #1 above and be bold. It doesn’t hurt to introduce yourself if you’re feeling left out! 3) Be yourself – Don’t overdo it with a crazy personality. Most people are looking for authentic interactions with real people not a brand. Relax and let your true self shine through. Any other questions I could answer about BlogHer Food? I’m only going to do one more post about BlogHer Food (the corporations who came and what I chatted about with them) so hang in there if these posts are completely boring and trite. Oh yeah, I’ll do a giveaway too! I remember back in high school my teacher was one of those teachers who wanted new teachers continue teaching. That food looks like something I'd eat. If you don't mind sharing, how much do you pay for school lunch? I knew a couple of my peers were too rich for "reduced" aka free but too poor to pay every day for a meal. So most times they just opted out for a bag of chips at the corner store.. I pay $3 per lunch! 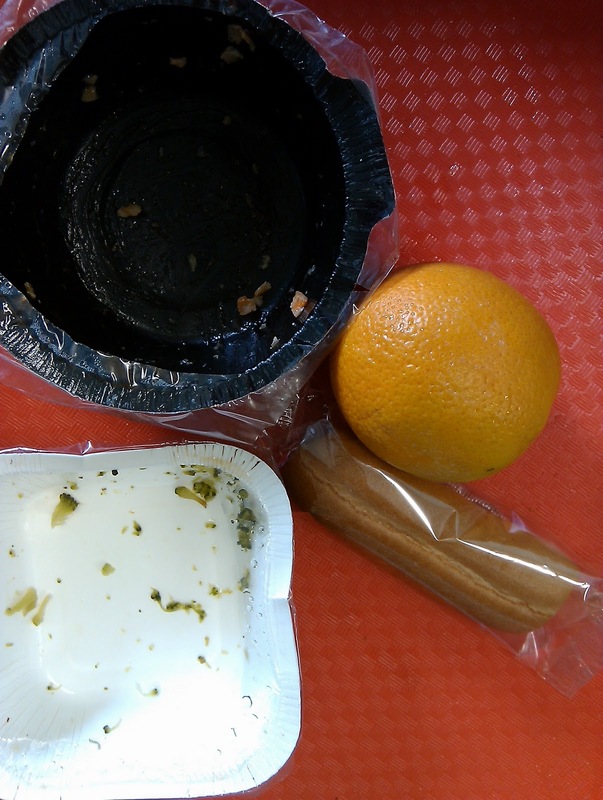 The lunches do look like they are improving, though the more I pay attention, the more I'm bothered by the volume of starchy foods in a typical meal. And I'm not just talking about school lunches. I've started noticing nearly half the dishes at family gatherings tend to be either breads, pastas, or starchy vegetables. I'm in a completely different niche, but I would love to go to Blogher. I have neither the money nor the size to justify it though, so I greatly enjoy posts such as these. I know school reform is not the intent of your blog, but as a special ed teacher I love your comments about how teaching isn't fun anymore (at least most of the time). I specifically came to my school district because of the innovative co-teaching and neat things teachers had the flexibility to do in the classroom. Fast forward 4 years, new district administration, no more co-teaching, classroom teachers must all be on the same page of the new basal series on the same day, and special ed is now pull-out SRA programs that have the same stories in them that the 1970s version did (honestly-we still had an old version stored in the school and there were no changes we could see). I get mad that I have a masters degree, know the research about multisensory instruction, and a passion for this, but all I'm allowed to do is read the SRA script, and snap my fingers for the kid to respond on command, and respond "correct". Really in 2010 I am supposed to teach a kid to read just like I trained my dog to sit? And I work in a "good" district. Even though I LOVE teaching, I'm wondering if I should get out too because I don't get to teach anymore. What other career can one do with a teaching degree? Anon. 7:53, If you find out let me know. My husband has been asking the same question for a few years now. I would actually eat that chicken and rice. The breadstick WAS useless with that lunch because of the rice. Found this cool article…check it out! Whatcha think? Mrs. Q said, "Is it wrong to call it a bread tampon?" Mrs. Q, you crack me up!!! I never saw that one coming! I showed it to my sister and she asked, "Who IS that woman?" Who indeed! I think your posts about the conference are anything but boring and trite and I can't wait to hear about your conversations with corporations. I'm also glad that you rarely delete comments. I'm always interested to see what your other readers have to say even if I disagree with some of their opinions. The wide variety of perspectives is one of the cool things about your blog. Fearless Freak, I’m with you 100%. Along with the issues of the food, the whole lunchtime “experience” needs to be addressed. How long do the students have to eat? Is there sufficient supervision? How rushed or crowded are the students? Noise level? It’s all part of it. Mrs. Q, I know you’ve commented about the bread regulation before. I’ve asked and I don’t think you’ve answered – what meal planning system your school uses and what grade level? If you have and I missed it, I apologize. The exact regulation depends on age/grade level and meal planning pattern. IF your school follows the Enhanced Food Based pattern. IF the grade level is k-6: the requirement is 12 servings per week. Minimum of 1 per day (but, with 12 per week, you are likely to see more than that minimum each day.) What counts as a serving? That varies depending on the product. IF a school wants to receive the funding, yes, they must follow the current regulations. Please do note – This applies only to the meal planning pattern I stated and the grade level I stated. The exact regulation will vary if a different meal planning pattern is being used or if the grade level is different than I’m assuming. The reason for so many starches at family gatherings are that people just don't have the money to entertain like they used to. When you've got to bring something, and you've got 7.00 in your bank account (like I did last week) then it's pasta salad that you bring and if anyone sneers at it, then shame on them. LOL…a bread tampon! I love it and I sooooo needed to laugh today. Love your blog and what you're doing! I've been advocating for healthy schools for the past few years and need some help. When our principal announced a Pizza Hut lunch over the loudspeaker, I queried the nutrition services director about finding alternatives to promoting fast food in school. I was told pizza is not on the fast food "list." Our state has one of the highest rates of childhood obesity so I would like to find a message board where I can share the challenges I'm encountering with others who are working on the same issues plus exchange advice about what's working and what's not working. Do you know of anything like this? 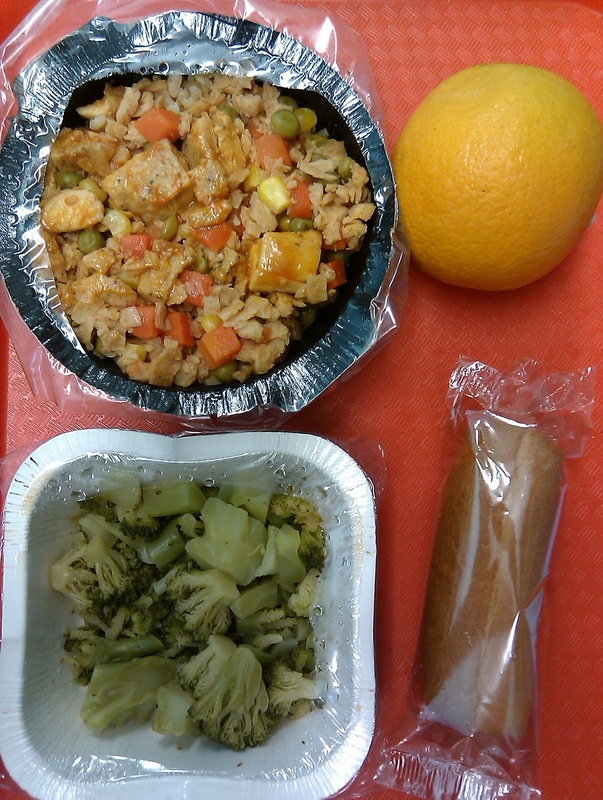 Please share ideas for healthy box lunches that can be served during cafeteria renovations. I loved your thoughts on the conference. Well stated! Thanks for your comment, my friends! Magie – I'd love it if you could email me fedupwithlunchATgmailDOTcom because I don't know what the meal planning pattern is and I don't know where to look for that information! To the special ed teacher — you stated it perfectly. Thank you. I don't know what to tell you! Be glad to e-mail – probably this weekend. Thanks for asking. The problem is, unless you ask the staff or contractor, we might not know for sure which meal planning pattern is being used. I've posted links in the past about the info (all the regulations – and, yes, there are a lot to consider), but it was much earlier in your project. Our school does slice up oranges for kids. They are listed as orange "smiles" on the menu. I was surprised though, the other day that my son said if you bring a whole apple to school there is someone with a peeler who will peel it for you! There is always someone walking around keeping an eye on the kids, and if you just raise your hand she will come help you. I would imagine she would be able to help open any packaging (fruit cups, etc) as well. We are a small school in a large district (AAAA), and I love that a lot of the details are well thought out here! We have a half hour to eat, but if kids finish early they get the extra time on top of a 15 minute recess. As long as it is not raining or snowing they are sent outside, even if it is chilly, so always take at least a coat. Half day K kids go out almost everyday as well. Grades 1 &2 have gym once a week, half hour, 3-5, twice a week. The more I read about other schools, I am so happy with ours!! I'm currently student teaching and today I spent most of the day trying not to cry because I don't want to teach this way. I hate the curriculum (CSCOPE) that we are required to use. There are things on the test that are not covered in the lesson plans that go with the material but you really don't have time to add anything to the material. And if you do try to fit it in there really isn't anyway to make it flow. You just have to throw something in where ever you can. It isn't teaching to me it's training kids to take a test that they is above their level and they really just don't give a rat's tail about it. Most are only there because they have to be. I've been there six weeks and I'm already feeling burnt out.